Sight is often taken as the most trusted human sense but paradoxically it is the easiest to deceive. For the section “Photo50” of the London Art Fair, Flavia Sollner will present a series of Polaroid prints called “The Night”, a series that challenges the photographic medium and the human eye in different ways. 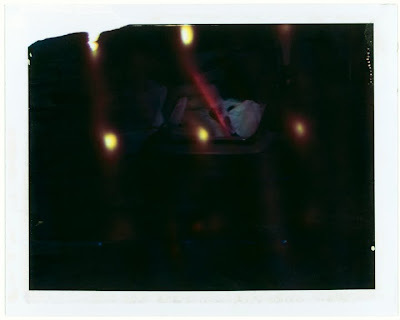 In the series of Polaroid prints, a medium that was chosen by the artist to contrast the alterability of the digital image, both in its appearance and meaning, darkness acquires an active role. The subjects that appear from the long exposure shots are taken out of their context, framed by the dark element in their pure visual presence, a presence that our eyes cannot recognize as is. A context is needed to analyze what we see, and darkness does not allow us to look for the bigger picture. The images obtained seem to be in constant movement among their different meanings, their possible lost contexts, between fiction and reality, planned and casual. Are they part of a blurred dream, a vision, or a staged reality? Or, are they crossing the boundaries between these two dimensions, like in an open-eyes-dream? Looking at these images is taking conscience of a process of hallucination. Darkness tricking sight in an image that is a pure account of a visual datum. The sense that helps us to believe in reality, blinded. Every time an image is framed, first by using photography and then, in Flavia’s case, using darkness, what can be seen in it enters in a parallel dimension of belief.